I've been revisiting the Ice Flows game which has been developed by the University of Exeter, led by Dr Anne Le Brocq, with funding from the NERC. 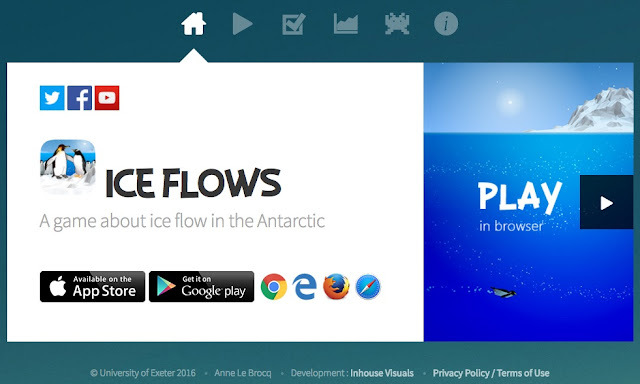 It was made to help disseminate the work of a research project on Antarctic ice sheets. The game is called Ice Flows - because it does! Ice behaves like a fluid and flows due to gravity, much like a blob of treacle does, though a bit slower. Snow falls on the top of the ice sheet, and ice is lost at the edges and underneath through iceberg calving and melting. If the inputs and outputs are equal, the ice sheet finds a balance – a “happy place” (or more scientifically, an equilibrium state), where the ice flows at a rate to balance these inputs and outputs. The game is based on a simple ice sheet model which represents the way in which ice flows, and how that flow is altered by changes in the surrounding environment. Computer-based ice sheet simulation models are used by scientists to both understand how the ice behaves and to make projections for future behaviour. Ice flows slowly, from a few metres per year, to several metres per day. In the game, time and space are modified to make the game playable. The game would take a very long time to play if we didn’t speed up time, the game time for one level represents thousands of years, though changes in ice sheets over decades can cause a significant contribution to sea level change. If the height and length of the ice sheet were representative of the real ice sheet , you would need to line up a few hundred phones in order to see the whole ice sheet. Hence, the ice sheet has been stretched in height in comparison to its length. Each profile represents about 1500 kilometres in length, and about 4000 metres in height. This year is turning into a bumper year for ice bergs apparently, with reports of a large number in the sea off the coast of Canada, and into the North Atlantic. It's just been the anniversary of a very famous ship hitting an ice berg last century. The US Coastguard and the Canadian coastguard monitors the ice situation in the areas around the USA. There is likely to be an increase in their number as glaciers continue to retreat and become unstable. They have also been seen a lot earlier than usual this year. More signs of trouble ahead. Icebergs are a resource of sorts. They are used for a number of things including water supply.